Have you ever followed a plant-based diet? For someone with food allergies, plant-based diets can be challenging because many of the recipes focus on nuts or soy - two of the top 8 allergens. That's why I'm excited to tell you about Debbie Adler's new cookbook, Sweet, Savory & Free with recipes free of all of the top 8 food allergens. Debbie so kindly sent me a copy to review. Wow, these recipes are so diverse and unique, and they all look delicious. "How can I help you with your blog?" Wow. Only a truly kind person asks you a question like that when they first meet you. And in addition to being kind, Debbie is just a downright awesome cook and businesswoman! If you don't know all about Debbie and her accomplishments, you can check out her cupcake business, Sweet Debbie's Organic Cupcakes, AND her Plant Power Rising website. And definitely check out this recipe! I made the salad with ingredients I already had in my fridge, but I love the idea of adding pickles and fresh squeezed lemon juice to my salad. To try next time! 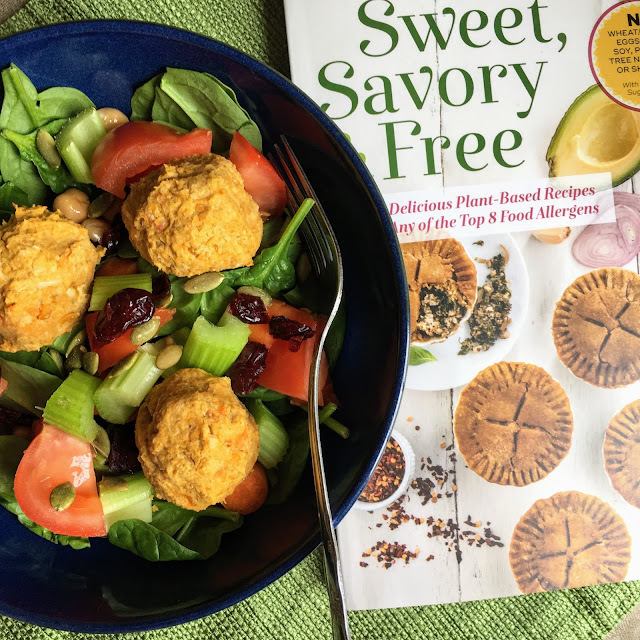 *Recipe re-posted with permission from Debbie Adler, author of Sweet, Savory and Free. **in the book, there's also a recipe for homemade horseradish! 2. Add the sweet potato to a small pot of boiling water, cover the pot, lower the heat, and cook until it is fork tender, about 10 minutes. Drain. Once it cools slightly, peel it and slice it into rounds. 3. Add the chickpeas, cooked sweet potato, garlic, parsley, cumin, coriander, salt and water to a food processor. Pulse until the mixture comes together but still has some texture. 4. Make 18 falafel balls, using about 1 tablespoon per ball, and place them on the prepared baking sheet. 5. Place the baking sheet in the oven, and bake until the falafel balls turn a light golden brown, about 20 minutes. 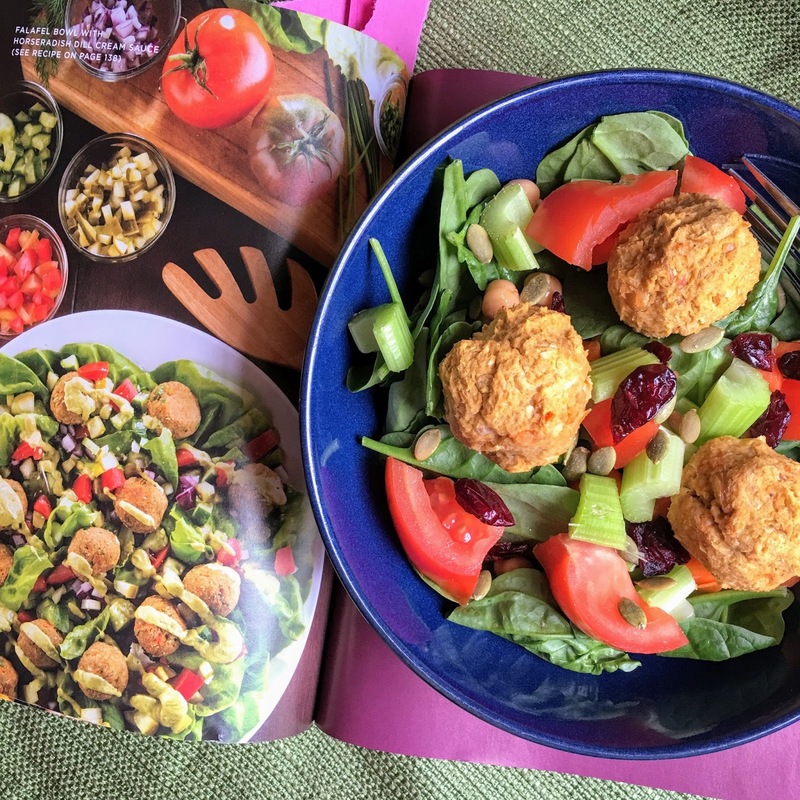 Turn the falafel balls over halfway through baking. 6. To make the horseradish sauce: Add the avocado, horseradish, dill, chives and hot sauce to a food processor and pulse until the mixture comes together. While the machine is still running, add the coconut milk, 1 tablespoon at a time, until the sauce is very smooth. Add a little water if the sauce is too thick. 7. To make the salad: Combine the lettuces, tomatoes, cucumbers, onion and pickles in a large bowl. Drizzle the vegetables with the lemon juice. 8. Transfer the baking sheet from the oven to a wire rack, and let it sit for 10 minutes. Add the salad and several falafel balls to each bowl, and drizzle the horseradish cream sauce over them. 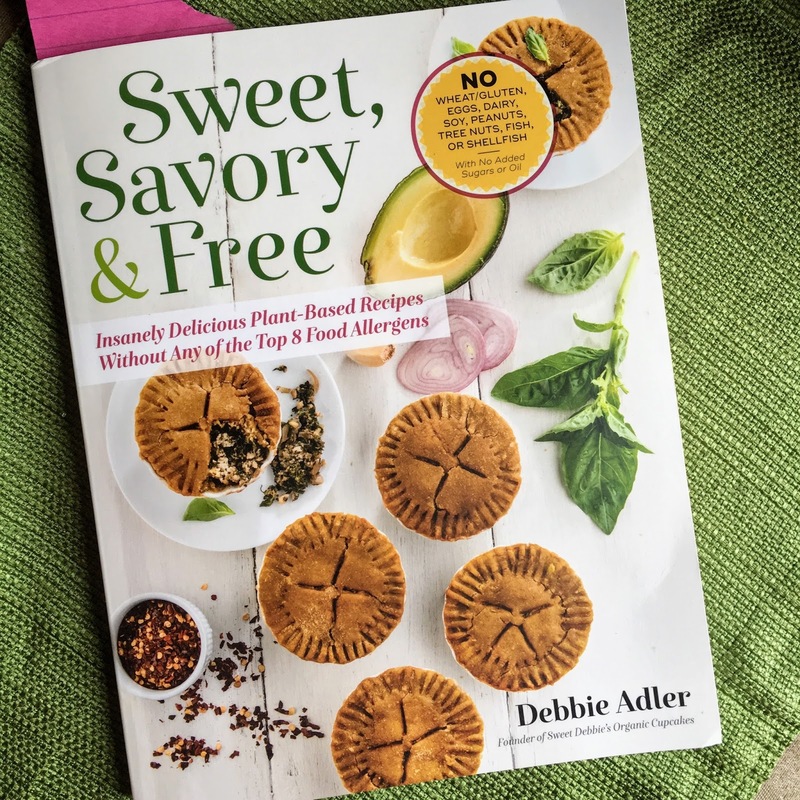 I hope you check out Debbie's new cookbook and enjoy! 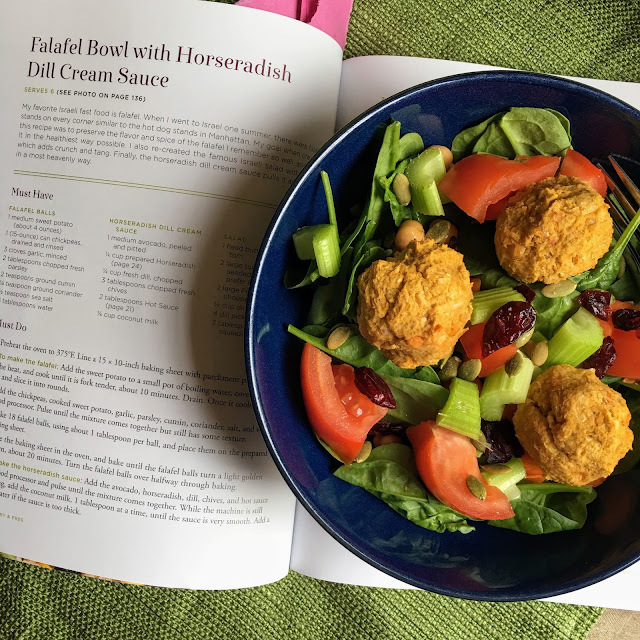 Thanks to Debbie Adler for sending me her cookbook to review, and for sharing this recipe with Mamacado readers. This post contains affiliate links at no cost to you!